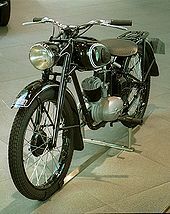 The RT 125 was a model of two-stroke motorcycle made by DKW in Zschopau in the 1930s, Industrieverband Fahrzeugbau and MZ in the 1950s and early 1960s, and DKW in Ingolstadt in the 1950s and 1960s. "RT" stands for "Reichstyp" or "National Model". In the 1930s DKW pioneered the Schnurle two-stroke loop scavenging process to dispense with the use of a deflector piston and improve efficiency of the combustion chamber. DKW also developed a highly efficient arrangement of transfer ports. These two features were included in the RT 125 to great commercial advantage. Competitor companies such as Adler and TWN copied the adoption of flat-topped pistons and strove to develop equally transfer port arrangements without infringing DKW's patent. The RT 125 is probably the most copied motorcycle of all time. After World War II the Soviet Union took plans, tooling and even several dozen personnel as war reparations to MMZ in Moscow (later transferred to MMVZ and SMZ) and to a factory in Kovrov, and produced copies of the RT125 as the M1A Moskva and K-125 respectively. WFM of Poland made a modified version of the RT125 (under SHL 125 and Sokół 125 brands), developed into 125/175 ccm family motorcycles, produced until 1985. RT 125 plans were also taken to the United Kingdom where they became the basis of the BSA Bantam, and to the USA where they formed the basis of the Harley-Davidson "Hummer". Later Yamaha in Japan copied the RT 125 as the basis of their first motorcycle, the Yamaha YA-1. 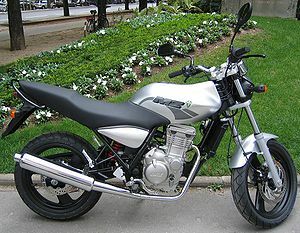 Since 2000 MZ Motorrad- und Zweiradwerk GmbH has used RT 125 to refer to an entirely new model of four stroke motorcycle. This motorcycle features a 125cc liquid cooled DOHC single cylinder engine. It is claimed to be the most powerful commercially produced four stroke 125cc engine in the world, developing 15 bhp.